Computer science program named among best in U.S.
For students completing a master’s degree in computer science, Rochester Institute of Technology is one of the top colleges in the nation, according to new rankings from GraduatePrograms.com. The education research website ranked RIT 11th among the top schools offering graduate programs in computer science. Instead of focusing on prestige and reputation, the 2016 list is based on the insights of more than 51,000 students from 1,700 schools who have experienced the programs and schools. The schools were ranked based on several categories, including quality of instruction, students’ satisfaction with their degrees, networking opportunities and financial aid services. To determine the top schools, the website used data from tens of thousands of submitted student reviews. 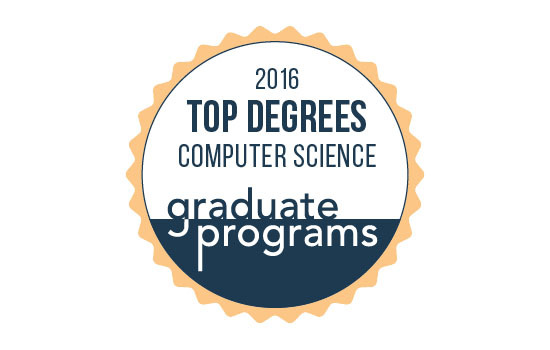 Each of the top 22 schools offering graduate programs in computer science received an average student rating of 3.57 or higher. RIT received a rating of 4.16 out of 5. The graduate programs rankings were created to help prospective students get valuable quantitative feedback from alumni. In order for a school to be eligible for the ranking, at least five students from that particular major must have submitted feedback on their institution. Data used in the school listings was gathered in 2015-2016 from the National Center for Education Statistics (NCES). This site is the primary governmental entity for gathering and presenting data related to education. RIT’s Department of Computer Science is housed within the B. Thomas Golisano College of Computing and Information Sciences. The master’s program provides students with a theoretical and practical background across the computer science discipline, with an emphasis on software development. A diverse set of course clusters gives students the opportunity to obtain depth in a computer science discipline, including computer graphics and visualization, data management, distributed systems, intelligent systems, programming languages and tools, security and theory.